금속 코팅 적용된 이산 초전기 센서. 높은 평균 파워. TO5 and TO8 packages make the QS-H detectors small and easy to integrate in an existing system. 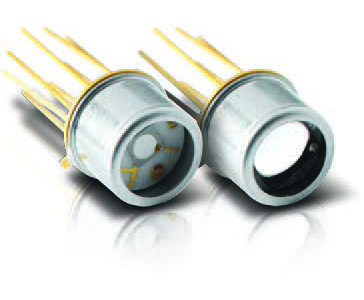 5 mm and 9 mm diameter pyroelectric sensors make optical alignment easier. Evaluation test box for QS detectors (in current mode). STAND NOT INCLUDED (recommended model #200428). 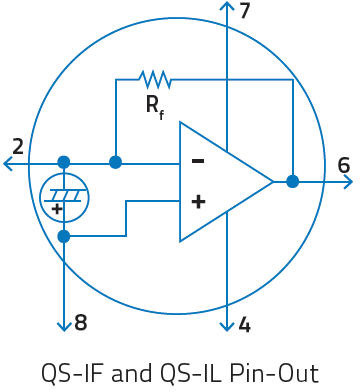 Permanent window for TO5-based or TO8-based QS detectors. Photodiode vs pyroelectric detector for measuring pulsed UV lasers? Choose wisely! Pyroelectric detectors: A perfect match for your pulsed Laser! Our pyroelectric detectors are a class of room temperature thermal detectors that produce a current output that is directly proportional to the rate of change of temperature when exposed to a source of radiation. They are best described by an AC current source, capacitor and resistor. Their current output is governed by the equation I = p(T)·A·dT/dt, where I is current, p(T) is the pyro coefficient, A is the area as defined by the front electrode, and dT/dt is the rate of temperature change of the pyro crystal. The advantages of a pyroelectric detector over other IR detectors are: room temperature operation, broad spectral response, high sensitivity (D*) and fast response (sub-nsec into 50 Ω). Our passive discrete pyroelectric detectors range from 1 to 9 mm in diameter and are provided in two configurations: high sensitivity or high average power. They present a pyroelectric detector element covered with our metallic coating (MT) and are packaged in a miniature TO-5 or TO-8 can. The diagram shown left identifies the pin-out for both types of detectors. Our organic black coating (BL), increases the optical absorption and helps flatten the spectral response. We also offer a number of permanent IR Windows that can be added to the TO can. These discrete pyro detectors are ideal for pulsed laser applications. Pyroelectric detectors are high impedance (>1013 Ω) devices that require use in an impedance converting circuit when trying to achieve the highest sensitivity (high D*). 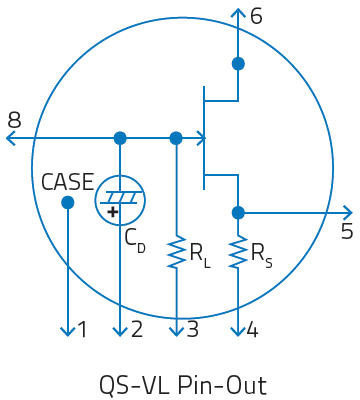 Our QS-VL Series detectors include our pyroelectric element mated to an ultra-low noise FET in a source follower circuit. These are in turn packaged in a miniature TO-5 or TO-8 can. 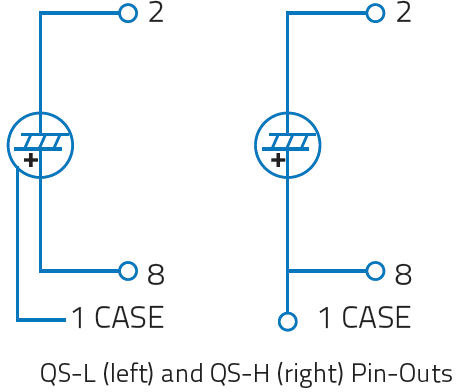 The equivalent circuit and pin-out for this series are shown at the left. They are also available is sizes ranging from 1 to 9 mm diameter. These models are ideal for analytical instrumentation applications like broadband IR radiometers, optical pyrometer, and/or FTIR spectrometers. These detectors offer high gain (>105 V/W) and/or high bandwidth (>10 MHz). In this configuration, the pyroelectric detector element is combined to a low noise operational amplifier. 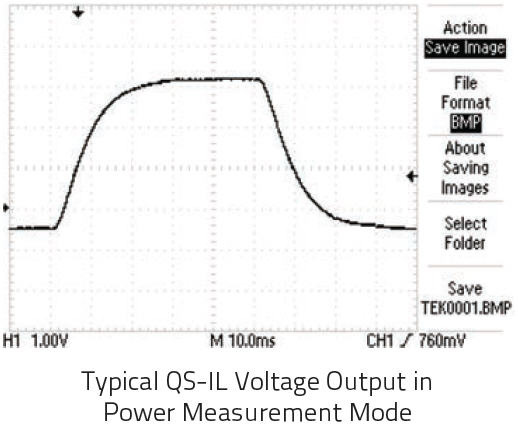 The QS-IL models are designed for high performance at low to medium frequencies, while the QS-IF models offer good performance at medium to high frequencies. These detectors are very easy to use. Simply supply the +/- 10 to 15 V to power the operational amplifier and add an external resistor, if required, to adjust the bandwidth and you are ready to measure pulsed, modulated or chopped sources, from nJ to m J and nW to W. These detectors also make great candidates for any variety of broadband analytical instruments or laser measurement products. Our QS-VL and QS-IL hybrid detectors are designed to maximize voltage output at low frequencies and therefore include load and feedback resistors in the 100 GΩ to 300 GΩ range. They are also designed into 8-pin TO packages that allow the addition of an “external resistor” to lower the output and increase the bandwidth. The circuit diagram at the left shows a typical hook up for our QS5-IL detector (with our MT coating), using external resistors and capacitors. Our QS-IF series, on the other hand, are designed for high bandwidth applications and therefore include a smaller feedback resistor of 100 MΩ. For expert help on designing a detector circuit please contact us. 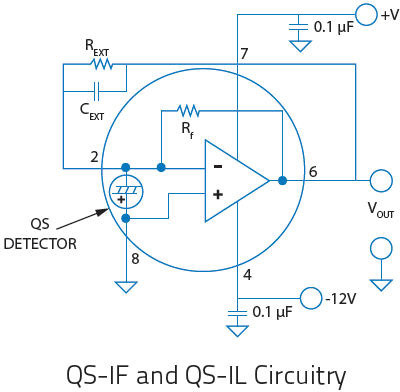 When using our QS-IL hybrid detector to measure the power (in watts) of your CW or high rep rate source (quasi-CW), you will need to employ an optical chopper. 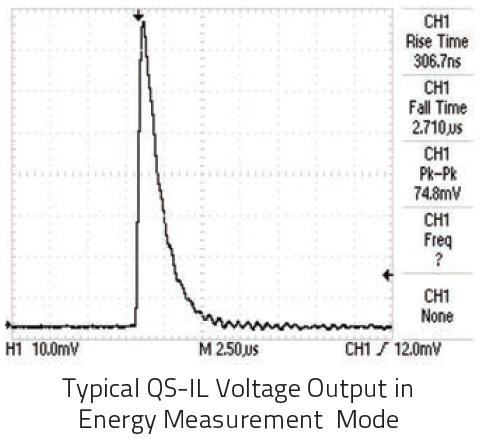 The diagram at the left shows the typical voltage output of a QS5-IL when used with our QS-I-TEST evaluation test box. Note that the voltage output is an approximate “square wave” whose rise and fall times are governed by the RC time constant of the circuit. The optical power is directly proportional to the peak voltage minus the baseline voltage. We calibrate these devices when operating in this mode. Our pyroelectric detectors are an ideal choice when measuring the performance of your pulsed laser in the range of nJ to mJ, across the full spectrum! The scope trace at the left represents the typical output from a QS9-IL, when used with our QS-I-TEST set up as an integrating joulemeter. Note the fast rise to a peak and then slower decay governed by the RC time constant selected for the integrating circuit. In this configuration you can measure absolute pulse energy, rep rate, and pulse-to-pulse stability. The maximum pulse width of your source is determined by the RC time constant you select and there is no limit as to how short the pulse can be! 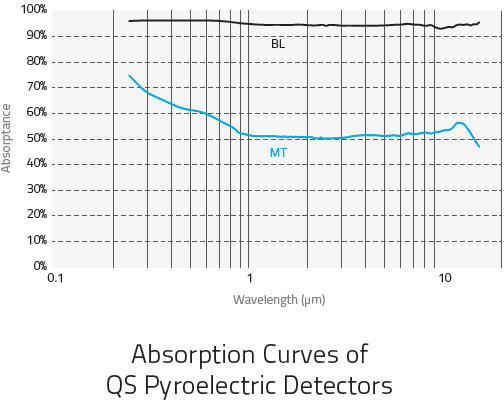 Unlike photoconductive and photovoltaic detectors, our pyroelectric thermal detectors are not limited to a small part of the electromagnetic spectrum. They are truly broad spectrum detectors, sensitive from 0.1 μm to 3000 μm (EUV, FAR IR, and THz). Any and all radiation absorbed by our coatings or pyro crystal will result in a measurable signal. The two plots at the left show the relative spectral response of detectors with MT and BL coatings. Note that the well documented, NIST traceable calibrated portion of these curves runs from 0.25 μm to 15 μm. There are currently no traceable optical standards for measurements > 15 μm.